Mumbai, India – The state of Maharashtra has launched a targeted effort to improve the quality of health care services provided to women during childbirth to help reduce the deaths of mothers and newborns. 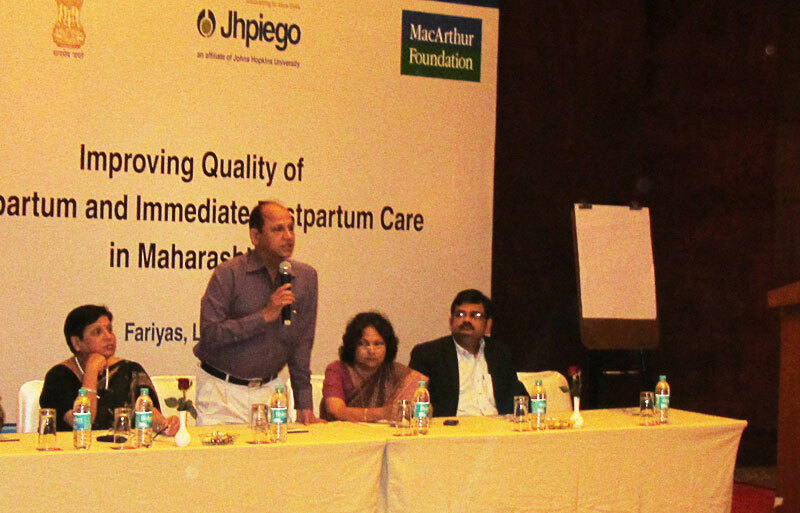 With technical assistance from Jhpiego, the “Improving Quality of Intrapartum and Immediate Postpartum Care” program will implement the Government of India’s Basic Emergency Obstetric Care Guidelines in 13 health facilities in the districts of Pune, Thane and Raigad, and ensure health care providers have the clinical skills to carry them out. The program is aimed at improving gaps in health services provided during labor and delivery and within 48 hours after birth. The initiative will focus on such practices as performing active management of the third stage of labor; administering appropriate antihypertensive and magnesium sulfate for severe pre-eclampsia/eclampsia; applying infection prevention practices; using the partograph;and providing essential newborn care, including early initiation of breastfeeding, newborn resuscitation, weighing of the newborn and measurement of the respiratory rate and temperature before discharge. The John D. and Catherine T. MacArthur Foundation is also supporting this lifesaving initiative, which will include additional training on evidence-based clinical practices at public health facilities. In India, as in many other developing countries around the world, a large number of women and infants die during childbirth from easily preventable causes. The lack of quality in essential health care services is an important contributing factor. For every 100,000 births in the country, 212 mothers die (maternal mortality ratio or MMR). Of every 1,000 infants born, 44 die before their first birthday (infant mortality rate or IMR), many in the first 72 hours after birth. In comparison, the MMR in the United States is 21 and the IMR is 6. The leading causes of maternal and infant deaths are postpartum hemorrhage, pre-eclampsia/eclampsia and prolonged/obstructed labor (for mothers); and asphyxia, hypothermia and sepsis (for infants). Evidence suggests that a large proportion of these deaths can be prevented by implementing simple practices that are proven, high impact and evidence based. In this context, the intrapartum (during labor and delivery) and immediate postpartum periods (48 hours after delivery) represent a time of significant risk for both mothers and their newborns. Though various government plans have increased institutional deliveries, the quality of care provided at these institutions remains suboptimal—lacking in infrastructure, trained human resources and standardized intrapartum and immediate postpartum care, according to a government review. Maharashtra, the second most populous Indian state, fares poorly on many of these counts. The fourth Common Review Mission identified severe gaps in the quality of skilled birth attendants, especially with respect to the protocols they follow for maternal and newborn care in the labor room. The goal of the program is to demonstrate and implement a responsive model to improve the quality of intrapartum and immediate postpartum care at health care facilities that can be scaled up nationally. On January 30, 2013, ceremonies were held to launch the program. During these events, officials from the Directorate of Health and the National Rural Health Mission of Maharashtra discussed the importance of this initiative in improving health outcomes of mothers and their newborns in the state. Health care providers and administrators from the target facilities who participated also pledged their support in making this program a success. Dr. Kanchan Jagtap, Deputy Director of Health Services from Pune District, encouraged providers from the state to “look at quality as an inherent part of the services being provided.” Dr. Sudhakar Kokane, the Deputy Director of Reproductive Health Services, spoke about his eagerness to see this program succeed and assured a “scale-up to all the facilities where deliveries take place” if the program demonstrates improvement in quality. 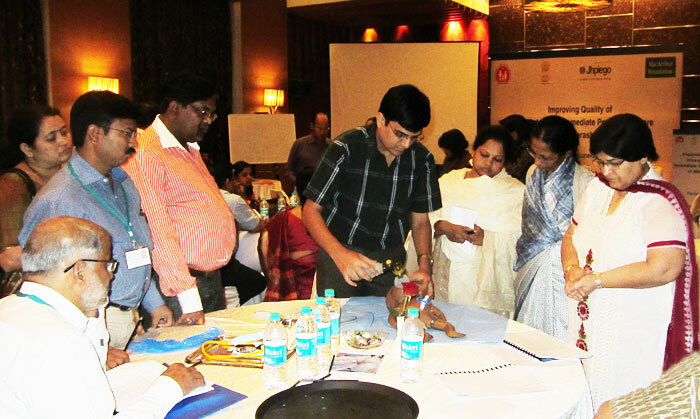 Jhpiego’s India Country Director, Dr. Bulbul Sood, and Dipa Nag Choudhury, the Acting Director of the MacArthur Foundation, also attended the launch. Sample Registration System (SRS) 2007–09. Janani Suraksha Yojana and Janani Shishu Suraksha Karyakram. The Common Review Mission was set up as part of the National Rural Health Mission Steering Group’s mandate of review and concurrent evaluation.